Businesses that operate hotels, motels, inns and other lodging establishments face a number of risks. The facility could be destroyed by a fire. A guest might sustain a slip-and-fall injury and sue the establishment for damages. Property of guests may be damaged or stolen while on the establishment's premises. If you own a lodging business, it's essential that your operation is properly insured. This article will describe the types of insurance a lodging establishment is likely to need. Any lodging establishment needs commercial property insurance to safeguard the business against losses caused by damage to buildings and contents. Many lodging businesses obtain property insurance as part of a package policy. Some insurers offer policies that are specifically designed for small motels, inns, B&Bs and similar businesses. These are often written on business owners forms and include a variety of coverages needed by lodging businesses. The limit you choose for your property policy should be based on a worst-case scenario. How much would you need to spend to reconstruct your building and to replace your furnishings if all your property was destroyed by a fire? Be sure to consider the value of any unique property your facility contains, such as antique furniture or fancy signs. Don't forget to include appliances like refrigerators and freezers. Commercial property can be insured based on its replacement cost or its actual cash value (ACV). Replacement cost coverage is the more expensive option but provides better protection. Without this coverage, a lodging business may be unable to recover from a large loss. Besides replacement cost insurance, you should also purchase building ordinance coverage. The latter covers the cost of upgrades that may be required by building codes when a damaged structure is repaired or replaced. 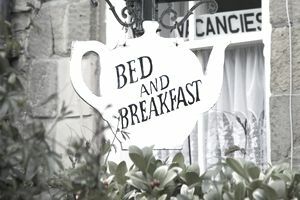 Do you own a historic inn or a bed and breakfast? If so, you may have decorated your establishment with expensive artwork, sculptures, oriental rugs and similar items. Many commercial property policies provide limited coverage for breakage of fragile items like statues and China. Moreover, artwork and collectibles are typically covered on an actual cash value basis. To ensure such items based on their replacement value, you will need to purchase fine arts coverage. Lodging businesses earn revenue by renting rooms to guests. If your building is damaged by a windstorm or other peril, you may be forced to shut down your business until repairs are completed. A standard property policy does not cover income you lose while your building is being restored. To protect yourself against income losses, you'll need to buy business income (also called business interruption) coverage. You should also consider buying extra expense insurance. It covers expenses you incur to avoid or minimize a shutdown of your business operations after your property has sustained a physical loss. Business income and extra expense coverages are automatically included in some package policies designed for the lodging industry. It is important to remember that property policies do not cover damage caused by floods, mudflow, volcanic eruptions, or earthquakes. If your business is situated in an area that is prone to these risks, you'll need specialized coverage. You can protect your business against damage caused by flood or mudflow by purchasing flood insurance. Damage caused by earthquakes or volcanic eruption may be insured under earthquake coverage. A child drowns in a swimming pool at your motel. A guest slips in the shower while staying at your B&B and sustains a serious head injury. All members of a wedding party become ill from food served at your hotel. A general liability policy will protect you against the types of claims cited above. Note that the policy includes product liability insurance. It covers claims against your firm by guests or other third parties for injury or damage caused by products (including food) that you make or sell. Many lodging businesses serve alcoholic beverages. Some serve only wine or beer, while others operate a full bar. If your establishment serves any liquor at all, you need liquor liability insurance. This coverage can be added to a general liability or package policy for an additional premium. Most states have laws that limit an innkeeper's liability for damage or theft that occurs to guests' property on the innkeeper's premises. These laws vary from state to state. Depending on the circumstances, an innkeeper may be liable to the guest for all or a portion of the loss. Thus, lodging businesses should purchase innkeepers legal liability coverage. This coverage protects your business from claims for damage, loss, or theft of guests' property while it is on your premises and under your control. Coverage will apply up to the limit stated in the policy. If your lodging establishment utilizes vehicles, you will need a commercial auto policy. Don't rely on a personal policy to cover a business-use vehicle. A personal policy contains a number of business-related exclusions. In addition, it is unlikely to provide auto liability limits that are adequate for a business operation. Most lodging businesses employ workers, so they are obligated by law to purchase workers compensation insurance. This coverage is available from a variety of insurers. If you need help purchasing choosing an insurer, ask your agent or broker for assistance. Two other liability coverages you should consider are a commercial umbrella and cyber liability insurance. An umbrella policy "sits on top of" your general liability and auto liability coverages. It provides limits over and above those provided by your primary policies. It also covers certain claims that aren't insured under your primary policies. An umbrella is important if your business incurs a catastrophic loss, like the child drowning incident cited previously. Like most lodging establishments, your business probably utilizes and stores electronic data. You may operate a website so that customers can make reservations online. You may also store customer data, including credit card information, on your computer system. This data creates a liability exposure. Your system could be hit by a cyber-attack. A hacker could steal data or release it on the Internet. Customers whose data was compromised might file a lawsuit against your business. You can protect yourself by purchasing a cyber liability policy. Keep Vandals Away From Your Property!